MATERIAL: Filled with 95% feather, 5% down, Medium Density, and has a Top Quality, 233 thread count fabric cover, made of 100% Cotton, with downproof stitching for exceptional softness, and long lasting comfort. USAGE AND CARE: For indoor use, with all types of shams & covers. 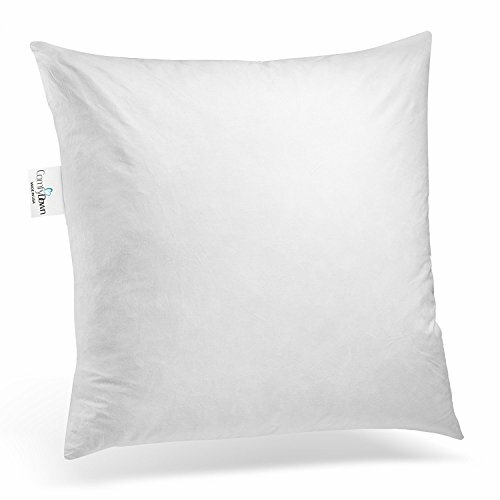 MADE IN THE USA: Our Pillow inserts are made right here in the UNITED STATES. We thank you for supporting American Manufacturing! DECORATORS: For best results, your pillow insert should be larger than your sham to correctly fill the corners of the pillow cover, this will provide a very attractive firm and fluffy look to your sham, we recommend to place our inserts inside shams that are 1" or 2" smaller than the pillow, It would depend on the thickness of the sham, for example, a thick fabric would need a 2" larger insert to keep it fluffed, a more lighter fabric would need a 1" lager insert.